This weekend we’re leaving for our annual vacation to the family camp in the Adirondacks. We’ll enjoy a week of fishing, hiking, and playing at the lake, as well as some good family cooking by Michael’s mom. She fixes these for us every year when we visit and it’s rare to have any left after breakfast, especially with my boys there! From Ann Meyers, from an unidentified old cookbook. In the large mixing bowl, beat the egg and stir in the milk and oil. In the medium bowl, sift together flour, sugar, baking powder, and salt. Add to egg mixture and stir just until flour is moistened. Batter should be lumpy. Do not overmix. Carefully fold in blueberries. Use the scoop to fill greased muffin cups 2/3 full. Sprinkle with cinnamon and sugar mix. Bake in the preheated oven for 20 to 25 minutes, until golden brown. Serve warm. For larger bakery style muffins, fill only 8 muffin cups. 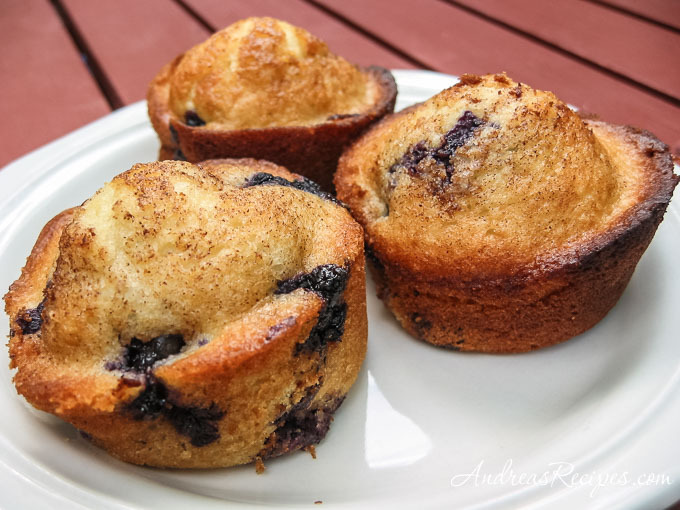 I love blueberry muffins, Andrea, and haven’t had any in months!! Was that right about 3 Tablespoons of baking powder?I made these today, but only added 3 teaspoons of baking powder. They turned out fine. They were not as sweet as I’m used to, but they were delicious. Thank you for your great recipes. Um, that would be 3 teaspoons of baking powder! Thanks for catching that, Carolyn! Hope you took a lot of these to camp. They look really delicious…bet they go fast.